With their truly exotic appearance their charming swimming motion and their fascinating social behaviour, seahorses make a fantastic choice for the home aquarium. However, they are very difficult to keep and cannot be recommended for the beginner. If you want to keep seahorses, you'll need to be prepared to make a lot of effort, to give them a lot of attention, and to spend plenty of time learning about them as you build up your seahorse aquarium. Seahorses are highly sensitive to stress, which can make them more vulnerable to all sorts of physical ailments. This is especially true of seahorses which have been caught in the wild. Because of this, and because capturing wild fish depletes marine ecosystems, it is wise to buy only captive bred seahorses from a trustworthy source. This will also reduce the chance of your seahorses being diseased. 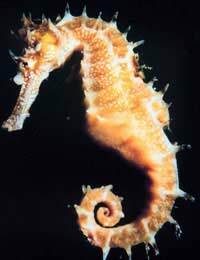 Seahorses are vulnerable to several diseases which normally only have a mild effect on other fish, and they are difficult to medicate effectively. For this reason, it is all the more important that you have good filtration and keep their water very clean. They need alkaline water and it is important to keep the pH consistent. With a very simple digestive tract and little storage capacity, seahorses need to eat a highly nutritious diet, and eat often, in order to survive. This should ideally include both live and frozen foods, though they may require some persuasion to accept the latter. Enriched brine shrimp, mysis, red shrimp and small crustaceans are a good choice. Vertical swimming space is important to seahorses, so be sure to provide them with a tall enough tank. Avoid strong currents which make it difficult for them to manoeuvre. They are happy living in groups but you should keep equal numbers of males and females. Add other kinds of fish only if they are peaceful by nature and won't compete hard for food. Seahorses should never be moved in a net, as this can damage their delicate bony plates. However if you observe all of these precautions, you can expect them to be relatively hardy. Barbour's Seahorses - Relatively large and hardy, these fish are admired for their bright yellow colouration. Dwarf Seahorses -Tiny and delicate, these fish are best fed on krill and small fish fry. They prefer a heavily planted aquarium. Big-Belly Seahorses -These elegant fish require a brackish environment. At risk in the wild, they should only be purchased if captive bred. Spotted Seahorses - Also known as Hudson's seahorses, these attractively mottled fish mate for life and should be carefully selected to preserve existing pairs. One of the most famous things about seahorses is their curious breeding behaviour. Most species can be bred relatively easily in a single species tank or special breeding tank. Besides keeping them in good condition, there is really very little that the aquarist needs to do to facilitate breeding. Seahorses will naturally form pairs and engage in complex courtship dances, often making loud clicking sounds by tossing back their heads. They will then embrace and the female will deposit her eggs in the male's pouch by means of a long ovipositor. Two to three weeks later, the male will open his pouch and expel the fully-formed fry. Seahorses typically give birth to large numbers of fry at once. They are good parents, but the fry are very delicate, and you will be lucky if you manage to raise more than five or six to adulthood from each brood. They should be provided with a specialist fry food and given small daphnia as soon as they are capable of eating them. Although seahorses require a lot of effort and attention, they are extremely rewarding to keep, and there's really nothing else out there quite like them. If you're up to the challenge and prepared to put in the hard work on an ongoing basis, they might be the perfect fish for you.